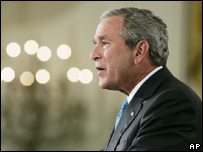 President Bush has revealed the existence of secret CIA prisons. He denied that the US had tortured the detainees and said the prisons had been a vital tool in the war on terror. Here are some key quotes from his speech. Captured terrorists have unique knowledge about how terrorist networks operate. They have knowledge of where their operatives are deployed, and knowledge about what plots are underway. This intelligence [...] cannot be found any other place. And our security depends on getting this kind of information. To win the war on terror, we must be able to detain, question, and, when appropriate, prosecute terrorists captured here in America, and on the battlefields around the world. Those held at Guantanamo include suspected bomb makers, terrorist trainers, recruiters and facilitators, and potential suicide bombers. They are in our custody so they cannot murder our people. A small number of suspected terrorist leaders and operatives captured during the war have been held and questioned outside the United States, in a separate program operated by the Central Intelligence Agency. We knew that (Abu) Zubaydah had more information that could save innocent lives, but he stopped talking. As his questioning proceeded, it became clear that he had received training on how to resist interrogation. And so the CIA used an alternative set of procedures. These procedures were designed to be safe, to comply with our laws, our Constitution, and our treaty obligations. [...]The procedures were tough, and they were safe, and lawful, and necessary. Terrorists held in CIA custody have also provided information that helped stop a planned strike on US Marines at Camp Lemonier in Djibouti - they were going to use an explosive laden water tanker. They helped stop a planned attack on the US consulate in Karachi using car bombs and motorcycle bombs, and they helped stop a plot to hijack passenger planes and fly them into Heathrow or the Canary Wharf in London. This program has been, and remains, one of the most vital tools in our war against the terrorists. I want to be absolutely clear with our people, and the world: The United States does not torture. It's against our laws, and it's against our values. I have not authorized it -and I will not authorize it. The Supreme Court's recent decision has impaired our ability to prosecute terrorists through military commissions, and has put in question the future of the CIA program. In its ruling on military commissions, the Court determined that a provision of the Geneva Conventions known as "Common Article Three" applies to our war with al Qaeda. This article includes provisions that prohibit "outrages upon personal dignity" and "humiliating and degrading treatment." [... ]some believe our military and intelligence personnel involved in capturing and questioning terrorists could now be at risk of prosecution under the War Crimes Act - simply for doing their jobs in a thorough and professional way.